Finished! 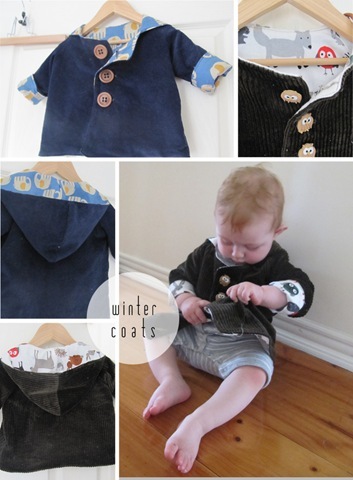 Two winter coats for Elijah. These were both made using the Sidewalk Jacket pattern by Owlybaby. I made a few alterations such as adding the contrast cuff, and changing the construction so the lining is completely attached to the outer fabric. It’s a great pattern that I would recommend. Thanks Kylie! I’m going to try make him some overalls next! They look so great! I love the fabrics you’ve chosen – the prints are really cute! Thanks for such a lovely comment on my beehive cushion. You really made me smile, you’re such a sweetie! sooooo adorable and REALLY well made! I’d totes buy one off you if i had a bubs! oh, these are lovely- the inside looks just as great as the outside!